Salmon is one of my favorite fish to eat, and there are so many delicious recipes out there for it. Not only does it taste delicious, but you also get all of those Omega-3 Fatty Acids that are so good for your health! Our Bolner’s Fiesta Brand® Lemon & Herb seasoning has a wide range of uses due to its complex flavor profile of spices melded with natural lemon extracts. It’s typically my go-to when I grill vegetables, but it’s also a hit when used on fish. 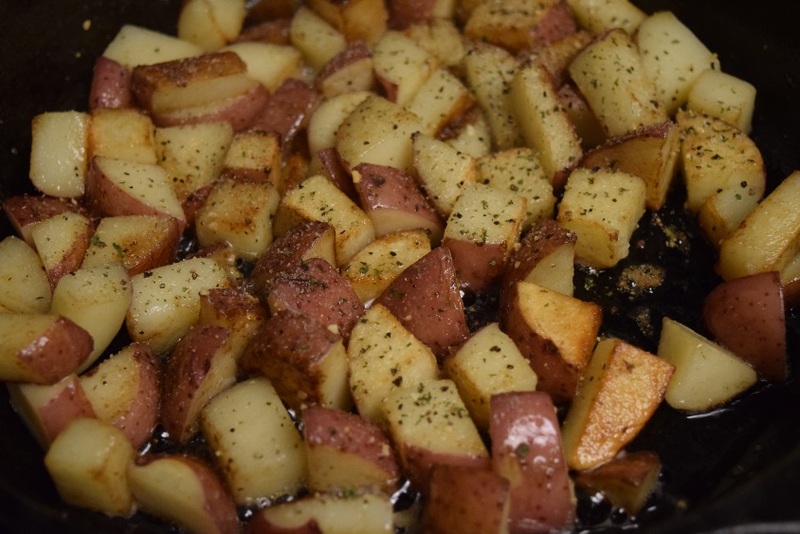 Place your favorite vegetable (in my case, skillet potatoes), alongside this simple dish to give you a tasty meal that the whole family will enjoy! In a skillet, combine 1 Tablespoon of oil and 1 Tablespoon of butter over medium heat. I love my cast iron skillet for these, but any pan will do. 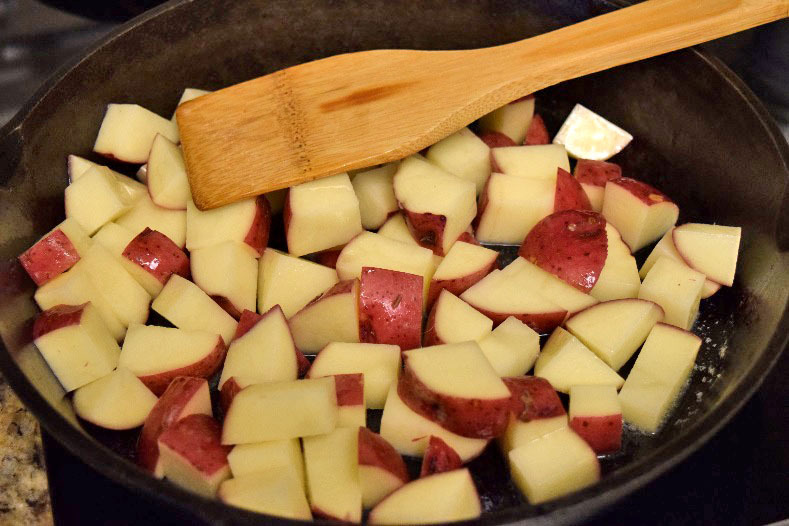 Once the butter has melted, add the potatoes, stir and cover. Occasionally check on them and give them a shake to ensure that the potato dices are browned as evenly as possible. After about 8 minutes, stir in the other Tablespoon of butter and 1 Tablespoon of Garlic Pepper. Cover, and continue to cook until softened and browned. Meanwhile, start on your salmon. 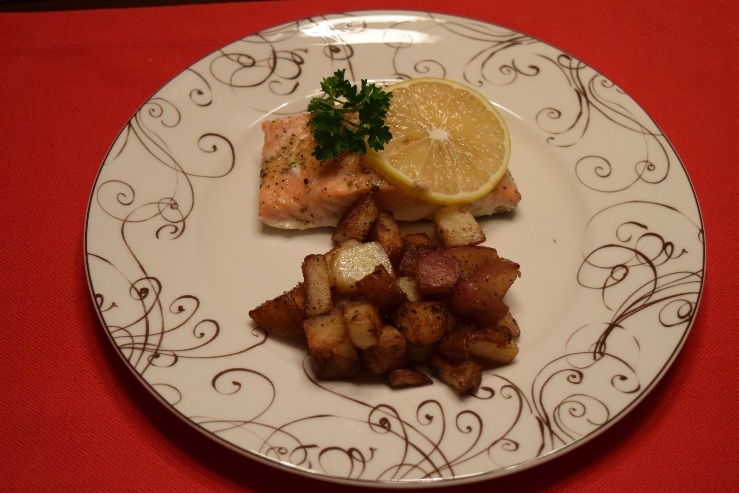 Combine on low heat the butter and lemon juice in a small skillet for the salmon. When the butter is melted, add the Lemon & Herb Seasoning and stir together for about 1 minute. The low heat will help release the oils from the spices in the seasoning and give you a bolder flavor. 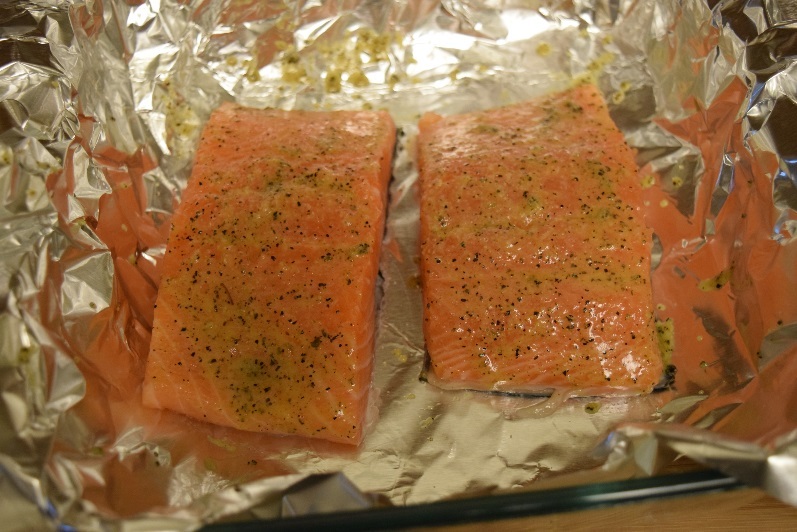 Rinse and pat dry your salmon filets, and place them on a piece of foil large enough to enclose them for baking. Using a basting brush or spoon, brush the lemon butter mixture over your filets until they are generously coated. Secure the ends of the foil and place them in the center of the oven. Bake for 15-20 minutes (depending on the thickness of your fish). When done, carefully unwrap your filets. The fish should flake easily and all of the translucence should be gone. By now, your potatoes should be ready.